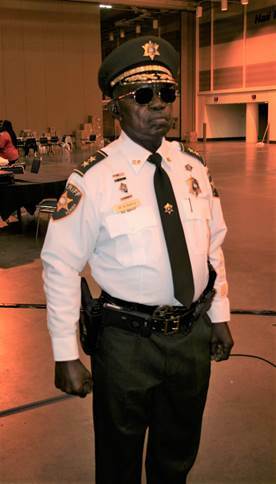 When dignitaries gather at Gallier Hall Friday night for the Krewe of Oshun Parade, they will be under the watchful eye of OPSO Chief Earl Weaver, who has been part of the Mardi Gras security detail at Gallier Hall for the past 43 years. Chief Weaver, who joined the Sheriff's Office 45 years ago, began working the security detail at Gallier Hall for the 1975 Mardi Gras Season, spanning the administrations of four sheriffs, seven mayors and 14 police chiefs. Chief Weaver begins his 45th security detail later today at Gallier Hall providing security under the administrations of Sheriff Marlin Gusman and Mayor LaToya Cantrell, whose Police Superintendent is Shaun Ferguson. Chief Weaver joined the Orleans Parish Criminal Sheriff's Office in December 1973 as Prison Officer 1 under Sheriff Louis Hyde. He has worked at the Old Parish Prison facility. He continued to move through the ranks, serving as head of the Criminal Sheriff's athletic department, warden of the juvenile division, commander of the reserve division, and Chief of Security. He is semi-retired now and serves on the sheriff's staff as Chief of Courts and Community Services. NOTE TO MEDIA: To schedule interviews with Chief Weaver, please contact Philip Stelly, 504.940.7267.